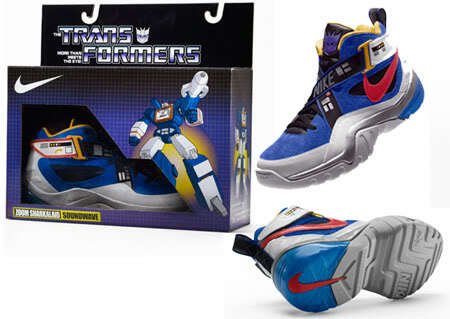 Nike and Hasbro have come together to create a Limited Edition Nike x Transformers basketball shoes Collection commemorating the worldwide premiere of the Transformers film sequel. They are complete with the nostalgic toy boxes with original Hasbro graphics and vibrant color. The shoe packaging complete with J-hooks for hanging display and decoder profiles on the back of the boxes that highlight each robot’s powers. 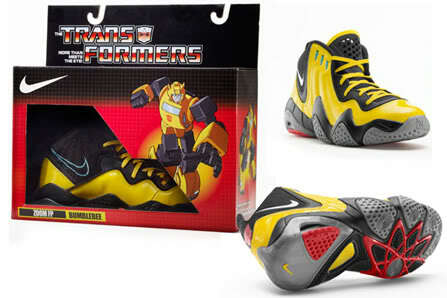 It was said that Nike Transformer shoes will be available in limited quantities in China, Hong Kong, the Philippines, Taiwan and the U.S. at House of Hoops this month. The Nike Zoom FP (Bumblebee) and Nike Sharkalaid (soundwave) are estimated to cost $100 USD and the Nike Zoom Flight Club (Megatron) will be $120 USD. Not surprising that Megatron is more pricey but where is Optimus Prime?! I love everyone of them tho. The shoes can't transform right??? 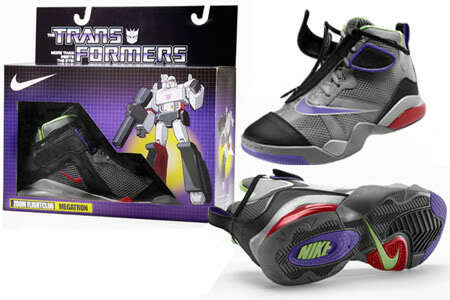 I want the Soundwave shoes! Wow those look awesome! I wouldn't mind sporting Soundwave or Megatron. BB is a bit too much yellow for me. If you are in US, head down to House of Hoops. It was said that these shoes are on sale there. Actually BB color tone is just fit for The L.A Lakers. LOL I wonder any NBA Basket ball stars are wearing these shoes. That would be super cool! I might get them if they cost less and I wouldn't have to go all the way to L.A. to buy some. The Soundwave pair looks sweet! That pair of soundwave shoes actually look the most retro among the rest. Seem like back to the future 2 futuristic Nike shoes model in different tone where Marty mcfly wore. I like The Nike Zoom FP (Bumblebee). Nice crossover! If I have, I won't wear it. Ha! Ha! I don't think it come in children sizes to begin with...I think that the best they can do as they following the cartoon vibrant color theme.